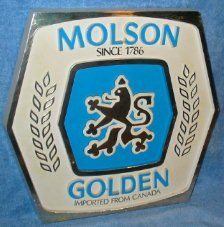 Molson Golden; 14 x 13 1/4 inch, 3-demensional plastic sign with hanger on the back. Some scuffing on the raised silver boarders. White portion as some light staining. Still a nice, attractive sign. Problems are not significant. I think this is a little older vintage.